Update: After Treasury Secretary Steven Mnuchin insisted this morning that there was no "quid pro quo" involved in the US's decision to take a second look at the sanctions it imposed on Chinese telecoms firm ZTE, President Trump reiterated this afternoon that the US and China have yet to reach a deal on trade, adding that he is "not pleased" with how the talks are progressing. While the talks with China were "a start", Trump said he's not yet satisfied. 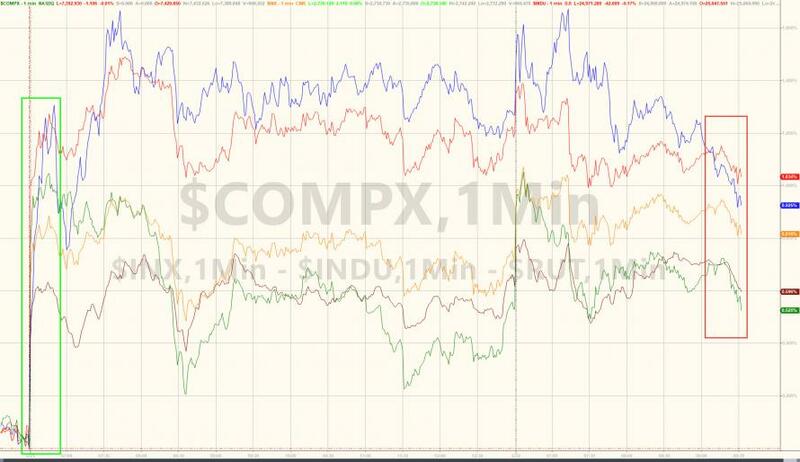 The news caused stocks to roll over as worries about a trade war - which had eased markedly on Mnuchin's "trade truce" claims - bubbled back to the surface. Trump added that he expects the US to levy a "very large fine" against ZTE and require new management and a new board of directors - all of which are reportedly conditions of a potential deal reported earlier. Meanwhile, Congress has decided to throw a wrench in the works after a Senate panel on Tuesday approved an amendment that would block Trump from easing sanctions on ZTE without first certifying that the company is complying with US law. Of course, Trump's direct contradiction of Mnuchin could be the latest sign that the Treasury Secretary, who was long seen as above the fray in Trump world, might be rising in the Trump administration dead pool. Trade talks between the US and China are set to continue in Washington and Beijing, and a comprehensive deal remains elusive, but in a sign of the US's growing commitment to compromise, the Trump administration has agreed on the "broad outline" of a deal that would save imperiled Chinese telecom giant ZTE Corp., the Wall Street Journal reported. The news bolstered NXP Semiconductors - whose purchase by Qualcomm now looks virtually assured, allowing hundreds of M&A arbs to finally exhale - which is up 1.8% in the pre-market, while ZTE sanctions benficiaries Ericsson and Nokia are down 2.2% and 0.9%, respectively. According to the WSJ, the US has promised to remove the ban on US companies selling components to ZTE - which it imposed last month, purportedly because ZTE failed to fire certain employees and cut bonuses according to the terms of a settlement after it was caught selling US goods to Iran. However, this is conditional on a final deal being reached. President Trump has said he's working with the Chinese to put ZTE back in business, because it's widely believed that the company will fail if the sanctions remain; on Friday, Larry Kudlow said the company would need to make changes to its management and board to qualify for US assistance. It still could be: already, the Trump administration is facing a growing backlash over the perception that it is "backing down" from a fight with China. However, Mnuchin has defended the detente and the administration's decision to work closely with the Chinese. On Monday, U.S. Treasury Secretary Steven Mnuchin told CNBC that "the intent was not to put the company out of business." Mr. Mnuchin also defended Mr. Trump’s decision to keep ZTE alive. It is "not a surprise President Xi asked President Trump to look into ZTE," Mr. Mnuchin said. "That’s no different than [the] president [calling] up world leaders on behalf of American companies all of the time." Meanwhile, stocks have been loving the trade-detente news, although since there isn't a formal deal yet, the situation could still unravel. President Trump has already backed away from imposing tariffs on $150 billion of Chinese goods, as he threatened to do last month, reportedly because of internal turmoil over the administration's trade strategy after Peter Navarro, one of the architects of Trump's trade hawkishness, has reportedly been frozen out by Mnuchin. At the same time, it has also been revealed that he supported Stefan Halpert, the FBI mole in the Trump Campaign, for a State Department job. Chinese spokesman Lu Kang has emphasized that the trade deal between the US and China is still being negotiated. Lu added, when asked about Trump's tweet about the implementation of sanctions on North Korea, that China always fulfills its obligations but also retains "normal" relations with North Korea.